Twitter offers “tons” of information from which we can learn a lot and we can find out about all that is happening in the world almost instantly. The problem is that many of us do not know how to find that information. 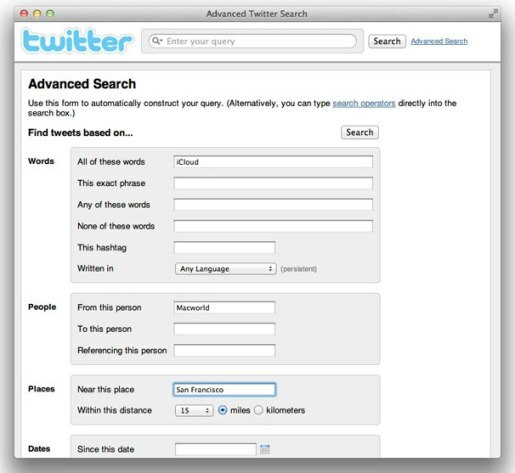 Although Twitter has a powerful search engine, most people do not know how to use it and go straight to the easier, place the search term in the box, click search and start browsing through the results looking for the information you need, which often involves spending too much time browsing through many results that do not work. If this basic search does not help, Twitter offers the possibility to carry out an advanced search which includes different filters searches like for example search for the exact phrase, results that do not include certain words, any words we enter, by language, search for people, places and other things, as you can see in the following image. The Twitter search engine also offers the possibility of using operators manually using the advanced search.